My daughter, Giovanna, and I stepped through the door of a one-room structure in a very remote village in the hills of Rwanda in 2016. There, we were greeted by a very shy woman, her name was Judi. Inside, there was no natural light, other than what shone through the door opening. After our interpreter introduced us and we exchanged timid hugs, we asked her to tell us her story. What we learnt was that she was a woman alone, raising two children. She barely survived, not knowing from day to day how she would feed or care for her kids, until she had been offered life-skills training by an international NGO (non-governmental organization). She shook her head and looked down when we asked what she had experienced during the genocide. Too much pain. Judi was eager to share with us that just a couple of years prior to our visit, she had been known as one of the poorest women in this village. Then she told us how that all changed when she was invited to join a 1-year training program that was offered to 25 women in this incredibly remote town. 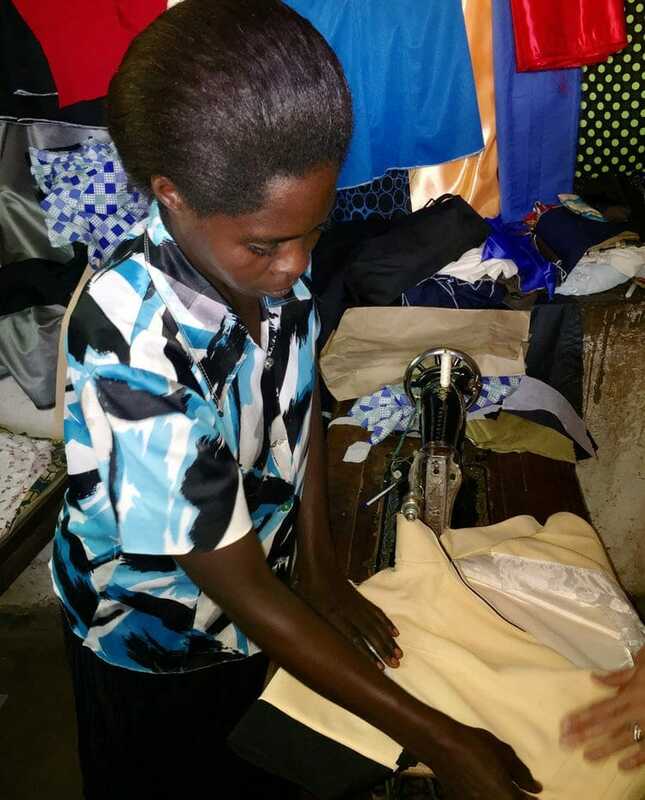 Judi was so excited that someone in the US had committed $400 to sponsor her for 1 year to make this transformation happen and to allow her to learn how to be a seamstress. Today Judi is the village tailor. Evidence of her skills – newly sewn dresses, school uniforms, jackets -- hang from the mud ceiling of her 1-room home, ready to be tried on by her clients. She proudly told us she had saved enough money to own -- rather than rent -- a sewing machine. Most importantly, she was able to look after her family, providing them food, clothing, and even health insurance. Judi’s story – the transformation of a life and family because of a learned and marketable skill -- is the story of millions of women and displaced individuals around the world. There are Judi’s in the Congo, Syria, India, Iraq, Cambodia and in the United States and United Kingdom. They are people who were born under a star of risk and uncertainty and untold pain versus the safety and security I have known most of my life. But just like Judi, peoples’ lives can be changed forever when they have the opportunity to lift themselves up through a marketable trade. The NGO that showed up for Judi was Women for Women International (www.womenforwomen.org). I went to visit that village where she lived because I had, for over 15 years running, been sponsoring women like her. I may never meet any of the women I sponsored in Nigeria, the Congo, Afghanistan or Rwanda. But every one of those women – individually and collectively – helped reshape me as a person. They have made my life so much better. I believe I did something for them. When I turned 50 in 2009, I conceived an idea to develop a cookbook that would highlight the work of Women for Women International. With the help of a team of 4 women who shared my belief in the organization and in our mission, we made it happen. To date, the book has sold over 65,000 copies and raised tens of thousands of dollars both directly and indirectly. Our dream was that for every book sold, someone would be moved to make a difference, to consider the opportunity to help another human being become self-reliant. Perhaps to sponsor someone like Judi. I have this same dream for Peace by Piece International, which I founded in August of 2017. For every gift item or event give-away that a business group or individual purchases, they provide income for the maker – someone who might be in a remote village in Nepal or on the outskirts of Chicago. It might be someone who survived genocide, someone who has been trafficked, someone who was incarcerated, or an immigrant seeking a better life. A second part of my dream – and my goal for Peace by Piece – is that the recipient of every PbP gift feels a impact, a blessing, from that product. I hope they will enjoy thinking about where that product came from, whose hands shaped that product, and how great the impact is of learning and practicing a skill and the role it plays in creating self-worth. I’m excited that Peace by Piece can help businesses make a difference in the lives of people like Judi all around the world and closer to home. Please join me on this rewarding journey!